DERALD EUGENE MILLER, beloved husband of the late Eleanor Rushfeldt Miller, passed away peacefully at the Good Samaritan Society-Garden Vista in Magrath, Alberta on Tuesday, January 29, 2019. Derald is survived by his children: Janice (W. Jack) Stone, Robert (Margo) Miller, Cameron (Jana) Miller, Sharon (Michael) Ryan, and Kevin Miller, as well as 27 grandchildren, and 90 great grand-children. Derald is also survived by his brother-in-law Donald G. Walker. He was predeceased by his brothers A. Glen Miller, Martin Miller, Clifford Miller and K. Leron Miller; and his sisters Vera Head, Belva Miller, A. Laretta Orr, Myrtle Miller, Martha Miller, Thelma Miller and Dorothy Bennett. Derald was born January 3, 1921 to Alma and Annie Bushman Miller, the eleventh in a family of 13 children. He was lovingly raised in a Magrath pioneer family and learned from an early age to work hard thinning sugar beets and planting and harvesting two large vegetable gardens. His life-long love of gardening continued through his 97th summer. As a young man he was a natural athlete and participated on many sports teams in Magrath with his older brother Glen as his coach. After high school he attended Calgary Normal School for a term and with the outbreak of World War II he trained and served as an outstanding flight instructor in the Royal Canadian Air Force. In 1948 Derald met and married the love of his life, Irene Eleanor Rushfeldt, a beautiful nurse from Heinsburg, Alberta. They made their home in Raymond where they worked together to raise their growing family. Derald’s life was devoted to his family, church and community. He prepared further for his teaching career by attending Oregon State College in Corvallis, Oregon where he earned his Bachelor and Master degrees while Irene supported the family by working in her nursing profession. Returning to Raymond in 1957, Derald enthusiastically built up the industrial arts program in the Raymond High School. Through many years he taught hundreds of boys and many girls the practical skills of drafting, woodworking, metal lathing and leather tooling. More importantly, he taught them patience and kindness and became a hero to many. 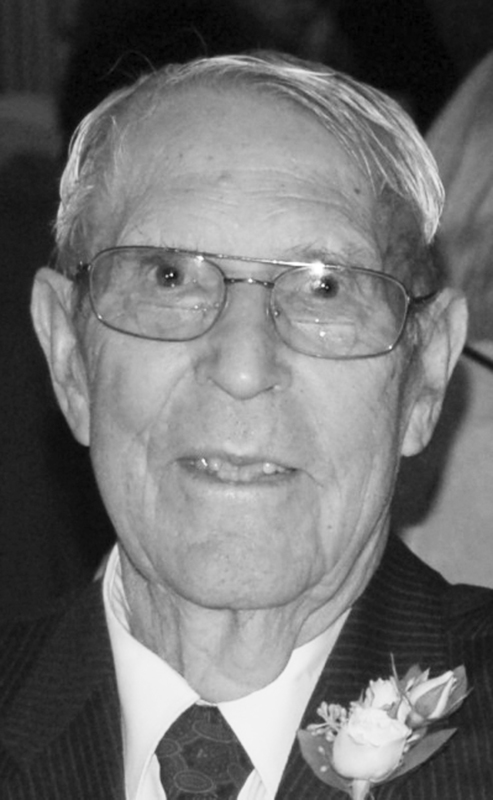 Later in his career he was principal of Raymond Jr. High School and also taught for a time at the Wolf Creek Hutterite Colony and briefly in Foremost, Alberta. Derald was a great contributor to his community, serving several years as president of the Raymond Civic Improvement Association. He served on many committees to spearhead the building and maintaining of the Raymond golf course and the Raymond swimming pool. Along the way he found time to coach basketball teams and enjoyed golfing and fishing with his many friends. Derald joyfully participated in the Church of Jesus Christ of Latter-day Saints extending his love and service to all. He and Irene served in the Cardston Alberta Temple for 23 years as well as a family history mission in Salt Lake City, Utah with their son, Kevin. Derald’s life was devoted to his large posterity but especially to his youngest son, Kevin, who was his best friend. His zest for life, sense of humour and outstanding example of love, service and caring blessed everyone. Derald was our great treasure and we will all miss him. Derald’s family would like to thank the staff of the Good Samaritan Society-Garden Vista for the special care and attention given in the last two months of his life. Friends may meet the family prior to the Funeral Service on Friday, February 8, from 10:00-10:45 a.m. at the church. The Funeral Service will be held on Friday, February 8, 2019 at 11.00 a.m. at the Church of Jesus Christ of Latter-day Saints; TAYLOR STREET CHAPEL, 221 North 400 West, Raymond Alberta, with Bishop Michael Stone officiating. Out of respect, he will always be known as Mr Miller to me as he was one of my school teachers in the 1970s (I was schoolmates with his daughter Sharon). I will always remember Mr Miller as a great teacher and a very kind and caring man. He will always remain as one of my favorite teachers. My thoughts are with the family. Derald was a good friend, along with Irene and Kevin. He was a person I looked up to and wanted to emulate. He was a shop teacher and upon retiring in 1982 continued to do woodworking in a shop in his back yard. He was very generous, allowing me to use his shop any time, whether he was home or not, ( he gave me the combination numbers to his lock). He was an avid gardener and I was most happy to help him plant his garden the summer before last. (At 96 still growing a garden; what an amazing person). May his family be comforted at their loss.